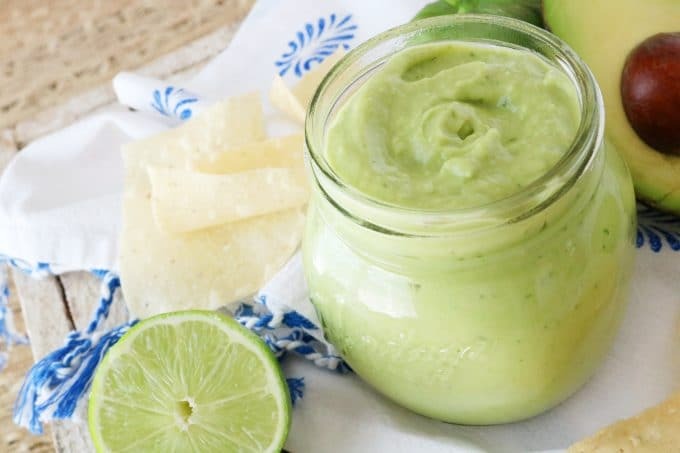 An easy, crowd-pleasing recipe for creamy tomatillo avocado salsa! 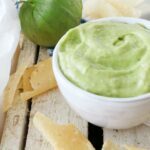 All you need is a few simple ingredients and a blender (or food processor) to whip up this super quick, absolutely perfect tomatillo dip! Texas is known for its Tex Mex cuisine, and it just so happens to be one of my favorite things about my native state. If you’ve never made it down to these parts, allow me to paint you a picture: You walk into a restaurant. Nothing too fancy, but the smell immediately seduces every last one of your taste buds. You’ll take a quick glance around, and you can’t help but notice there are baskets of warm, paper-thin tortilla chips on every table, accompanied by salsa. Before you even make it past the header on the menu, they’ll grace you with your very own basket and your very own salsa. Now tell me, what’s not to love about that? Here’s when you know if you’ve made it into the right spot or not: There should be not one, but two salsas sitting on the table. 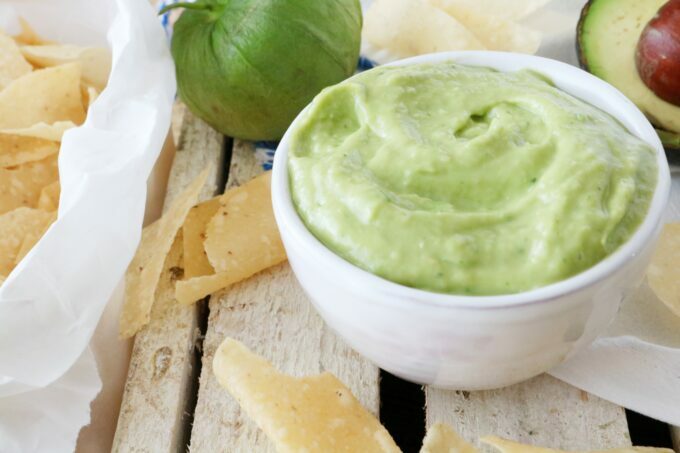 It’s green, it’s creamy, and it’s right where the money’s at — it’s tomatillo-avocado salsa. I know when I say tomatillo, some of you are already headed for the hills, but halt those steps for just a moment, and allow me to ease your nightshade veggie fears. Cause that’s all they are, ya know? A little nightshade vegetable that comes equipped with its very own little wrapper. So essentially, we’ve got ourselves a green little tomato in its very own little jacket, that goes by the name husk. However, in comparison to its popular cousin the tomato, the tomatillo is way more tart, far less pulpy, stays fairly firm even when ripe, and is every bit as good for making salsa. So now that we’re all cured of our tomatillo phobia, let’s talk about how to find vegetables worthy of a dip this delicious. Especially since this dip is pretty much all produce, we should probably start with A+ produce anyway, don’t ya think? Me too. Here we go! A few tips for working with both tomatillos and avocados, the core ingredients in our tomatillo avocado salsa. Look for tomatillos with fresh looking husks, that aren’t spotted with lots of brown. Also, choose tomatillos that feel full and firm rather than soft and mushy. When you peel back the husk from a tomatillo, you’ll notice it’s slightly sticky. To get rid of the stickiness, just run it under a little water, and you’re ready to move on to the avocado. Ah, the glorious avocado. What’s not to love about it’s smooth, creamy interior and heavenly flavor? Well, besides having to pick out a ripe one, without any of those pesky brown spots lurking under its exterior. Buy blackened avocados, avoiding those with a white powdery coating. To feel for ripeness, run your fingers over the skin. The avocado should feel full and give slightly when pressure is applied. Lastly, avoid avocados with any noticeable dips or crevices under the skin upon touch. To cut into an avocado, lay it on a cutting board, and have ready a sharp chefs knife. Begin with the blade of your knife facing the stem of the avocado. The blade of your knife should also be parallel to the cutting board. Cut into the avocado starting at the stem end, and using a gentle sawing motion, run your knife from the stem end all the way to the pit. Then, leaving the knife in its place, begin to turn the avocado 360° until it has made a full circle. This is where a sharp knife makes all the difference. Pull apart the halves, and lay the pitted side on the cutting board, with the pit facing the ceiling. Carefully, knock the blade of your knife into the seed just firmly enough so that it locks into the seed. Twist the knife slightly, and using a dry dish towel, carefully pull the seed away from the blade. Once your tomatillos and avocados have been prepared, the rest of the recipe is an absolute cinch! 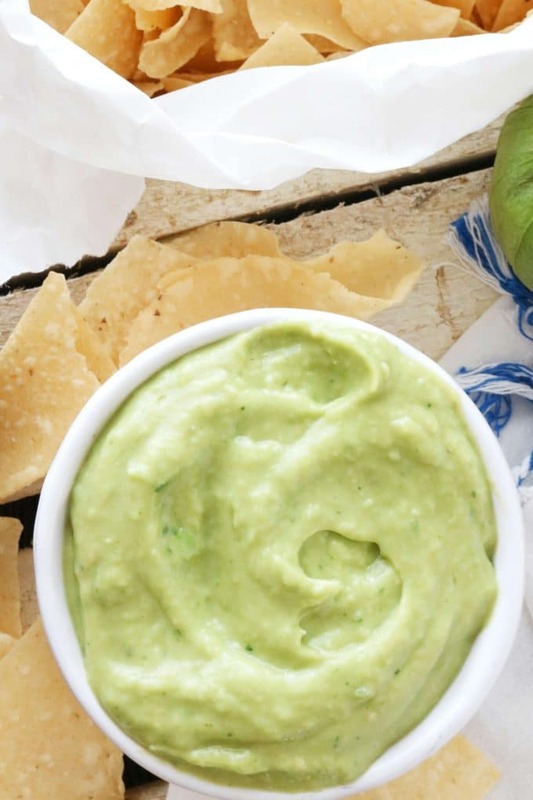 You’ll need a blender or a food processor to make this tomatillo avocado dip. Now, this is how seriously easy this salsa is to make, folks: The avocados? They don’t even have to be chopped. Just quarter them and throw those suckers in your blender (well, skin and seed removed, of course), along with some quartered tomatillos, half of a roughly chopped onion and garlic clove, along with a few cilantro leaves for flavor, and a roughly chopped jalapeno for a little heat. Then, add some lime juice and water to help the mixture blend smoothly, and press a button. How easy is that?! 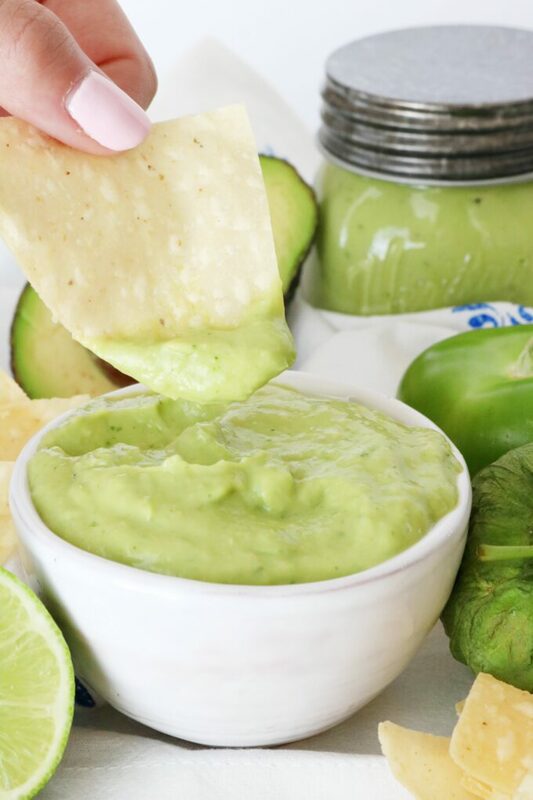 So when it comes to salsa, I think we are all in agreement that the one with avocados is pretty much always the winner, but a pair or trio of dips never hurt anybody. If you’re hosting a fajita night, check out these other easy Mexican dip recipes perfect for entertaining: crockpot taco queso, fresh salsa, and authentic guacamole would all look lovely next to a bowl of your creamy tomatillo avocado salsa! Please, enjoy! 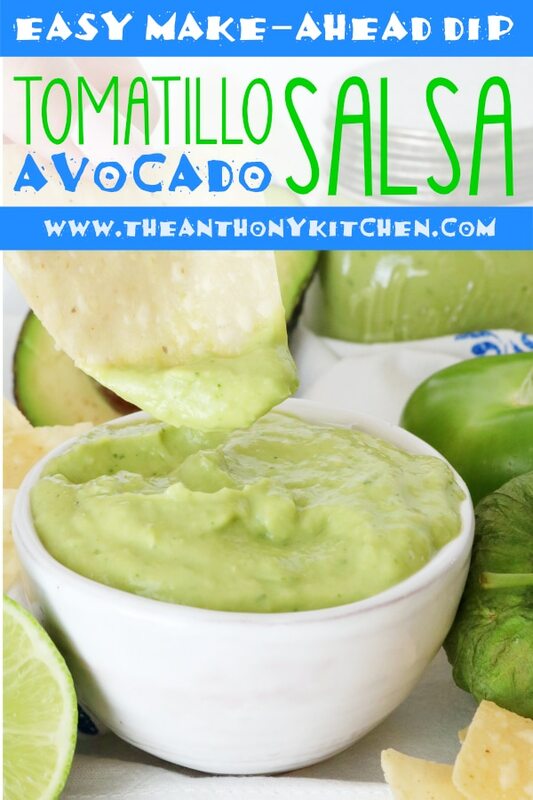 An easy, crowd-pleasing recipe for creamy tomatillo avocado salsa! 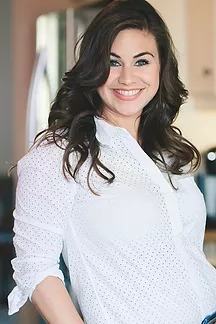 Add all of the ingredients, minus the cilantro, to a blender or food processor and blend on high until the ingredients are completely broken down and homogenous. Add the cilantro and pulse only a few times. Serve this alongside tortilla chips or fresh vegetables, or use it as a taco or burger topping. Enjoy!